Figure 1. Screenshot of Advanced search. AS functional annotation - Difference in length of encoded protein, AS relating CDS region, AS affecting protein function and complex AS pattern. Evolutionary conservation (RASVs of H-Inv full-length cDNAs only) - Exon level conservation (non-conserved, genome-conserved and transcript conserved) and transcript level conservation (non-conserved, genome-conserved, transcript conserved, ESV and conserved AS). 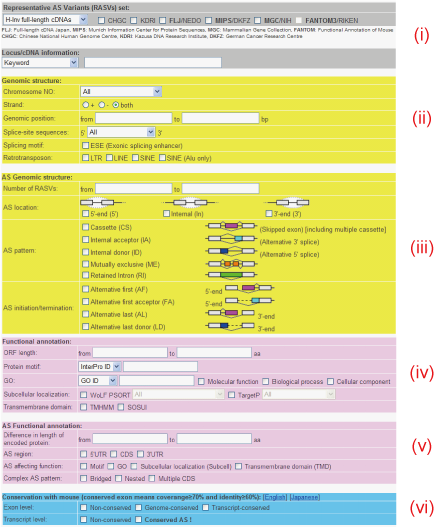 BLAST search - This page allows users to execute homology search for the nucleic acid and CDS sequences of RASV datasets. Figure 2A. Screenshot of AS Viewer. Figure 2B. 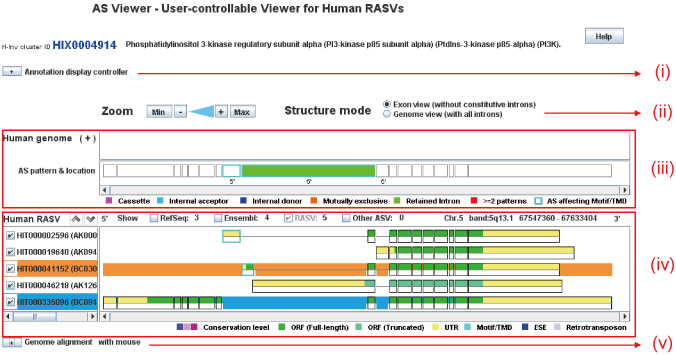 Annotation display controller of RASVs. Figure 2C. Human-mouse genome alignment and mouse locus.